Anidugbe Oluwatobiloba Daniel popularly known as Kiss Daniel disappointed a lot of Nigerians after he was busted on social media rocking fake Louis Vuitton designer shirt. Fans have patiently been waiting for a comment from him and he has finally broken his silence. 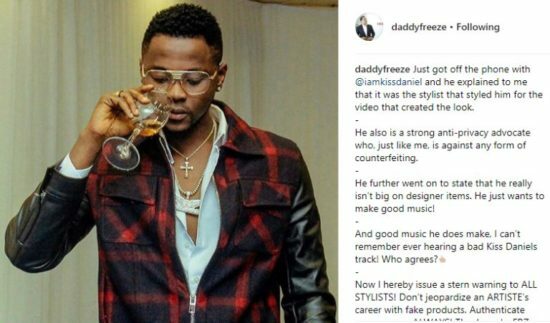 According to Media personality, Daddy Freeze, he spoke to Kiss Daniel earlier today and the Flyboi records founder revealed that the shirt was given to him by a stylist.